Over time seals begin to dry-rot, crack, and become ineffective. Causing water to leak inside your door and Jeep Wrangler YJ and CJ. Replace them with the Crown Automotive Door Seal Kit for the pair of your full steel doors. Offering a 12 Month/12,000 Mile Limited Warranty. Direct Replacement: Mounting in the same position and style that your Jeep was originally made. 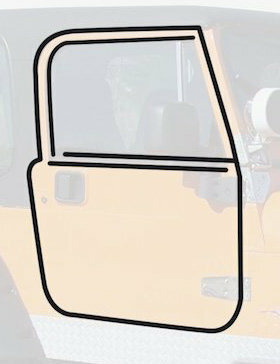 Vehicle Protection: Your Jeep deserves a quality seal kit to keep it protected from the elements.